EXXXXXXX…CELLLLLLLL…FRICKINGGGGGGG…ENTTTTTTTTT – thank you thank you a zillion times THANK YOU!!!!!! Apart from the obvious nuttiness of the whole anti-vax movement, calling Jerry Brown, who has a reputation as a very liberal democrat, a fascist is stretching it more than allowed by any sort of rational hyperbole. 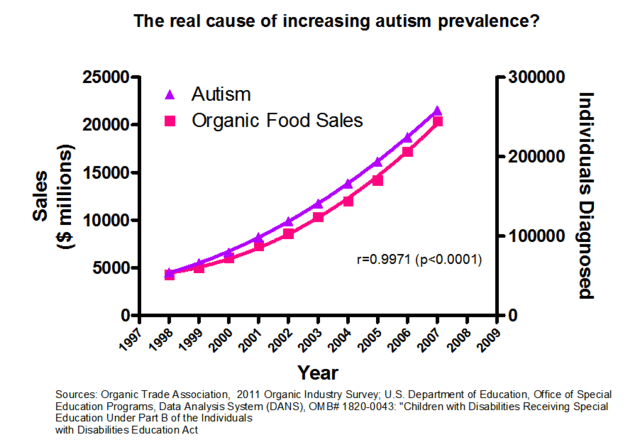 As with your organic food vs. autism curve, one could similarly pretend to “show” that Apple products induce homosexuality! It’s 2015 and some still haven’t heard of “Correlation does not imply causation”. And the graph above is a nice reflection of that. It’s also funny how people assume if particular element is ingested, that you’ll turn you into a horrible mush of pulpy organs in a matter of minutes. Have these people ever gone through biology classes or have done basic Googling? Human body is basically a giant garbage processor. The liver and kidneys can take unbelievable beating caused from chemicals and other elements that are not beneficial to operation of our body. You will only poison yourself if intake exceeds the ability of such organs to excrete these harmful elements. That’s why we have recommended daily intake values for pretty much every substance known to us. You can ingest cyanide if intake is so small that body is able to excrete it regularly. Like for example by eating almonds. Yeah, shocking, almonds contain cyanide. But in such small doses that body can excrete it without any harm unless you eat nothing but almonds in massive quantities. Then cyanide might start to accumulate (exceed excretion rates) and eventually cause organ failures. The amount of mercury ingested through eating a can of tuna exceeds all levels of mercury found in vaccines by thousands of times. And lets don’t forget the fact that you get vaccinated once, maybe twice in whole lifetime, but you can freely eat tuna daily. Are we banning canned tuna yet? Nope. No one screaming around demanding to ban tuna because it’s causing autism. Supposedly. Granted, overeating yourself with tuna is not healthy because of mercury traces in it which can start to accumulate (read the above paragraph), but then again, consuming too much water can also lead to H2O poisoning (I’m not even kidding, it’s related to mineral ions balance, Google it up). And the water is the most basic critically needed element for any living being to even survive. I think I need no further explanation in this regard. But we don’t feed tuna to babies you may say. Maybe not directly, but mothers can still eat tuna and then breastfeed a baby. Or even transition mercury through umbilical cord to the fetus when eating tuna while being pregnant. Idiots don’t know that somewhat regular consumption of tuna (or any larger predator fish) could potentially be more dangerous to the fetus or baby than a single time vaccination. I’m just sad to see how famous people like Jim Carrey abuse their fame into spreading their ignorance and misinformation among people where Googling of individual information can reveal everything you’ll ever wanted to know about anything. I’m not even directing people into reading pro-vaccination articles. Do your own Googling of toxins, their effects, their allowed intake rates, learn about your own body anatomy and how your very own body even operates. The more you know about yourself, the smarter you’ll be. I’ve never followed any pro-vaccination people. I’ve seen it being discussed and then I’ve made my own research. And I’m still for vaccination, because it is scientifically proven to work. We made certain diseases pretty much go extinct. Things like this don’t just happen by chance, you have to make a very systematic extermination of diseases using vaccines. If you don’t believe me, check the statistics of infants mortality from 100 years ago and mortality of infants today due to “petty” diseases like smallpox or measles. It’s science 101. While I agree tat the vaccine hoax spawned and furthered a platform for nutjobs to spew their irrational rhetoric re: vaccines casing autism, it is important to not repeat the irrationality and go the complete other way and say all claims about foods containing harmful ingredients is hogwash. For example, in your post, you state that “…almonds contain cyanide…” which is only partially true. Not all almonds contain cyanide – only bitter almonds do. And in fact, there have been reports of cyanide poisoning due to bitter almond ingestion as well as a very recent recall due to those almonds containing high levels of cyanide. Along this same point, apricot seeds can contain cyanide and extracts fro those seeds have caused cyanide poisoning resulting in death. So the point here is that both extremes – as with almost all issues – are usually flawed and serve to confuse the issue more than is required nor helpful. Thanks for the informative article; I’ll have to keep it handy for future vaccination discussions. It’s easy to forget how devastating these diseases were not that ago in the U.S. (and still are elsewhere in the world). Excellent post! Informative and presenting the research data. Take that, all of you celeb-u-scientists! So, first off I wanted to to say I really enjoy your blog. But, I’m of a different mind set when it comes to vaccines. Not so different when it comes to the “three questions”, but when it comes down to regulation/law. I’m pretty much an advocate of freedom given its inherent responsibility, but I’m also an advocate of education, awareness, environmental health, health, and ethics. I personally do not take flu shots, but I’ve been vaccinated as a child (born in 1989 in the United States). I hate getting sick or feeling ill for any period of time, and with any kind of symptoms that could be avoided naturally. I never get the flu, in fact each time (when I was younger taking flu shots) I got the flu it had to do with having the “immunization” or sharing something with an infected individual. I’m not the healthiest individual either, but I have better chances avoiding symptoms on my own. Not to mention, the fact that as a human whom hasn’t been infected, I should have the right to defend my body from needles and viruses being injected into it against my will. I take caution in what I eat, drink, use to avoid ingesting/contacting harmful substances at any dosage according to my will. The government has no place forcing them on me. They are not supposed to violate my person (property) nor my freedom. Laws originated to govern/protect property, in fact criminal offenses like assault arose in much the same fashion. Contracts are protected/governed for the same reasons. It is therefore unethical and unconstitutional in other ways. The government/agencies should be more concerned with the water than outbreaks of the flu virus. Those that want to avoid infection/contamination are free to choose. Those that would rather go with natural selection should be too. It’s a matter of principle not science. @Sue: The issue is this however – and speaking for the US only – when the state passes a law that runs afoul of individual civil liberties, the question is always asked what compelling interest does the state, as a proxy for the public, have in passing the regulation. In the case of vaccinations, the the state has a compelling interest to maintain good public health. The reasons why are obvious and the efficacy of vaccines cannot be discounted. So to the central question – does the gov’t have the right to force you to take a vaccine? The answer is yes IF you are first opting to use some public service at your own discretion. For example, if you want to send your kid to public school – or attend one yourself – then by all means the state has the right – and some would argue the duty – to ensure the students are vaccinated. Conversely, does the state have the right to just have you be vaccinated? Of course not – I agree, it is your body and as long as you choose to not integrate with the public in certain arenas, then you are left to you own decisions. The issue with kids and vaccinations in the school is complicated however by the fact that kids in many areas are required to attend school. This creates an issue in places where home-schooling is not allowed and people cannot afford a private school. So in those situations, the parents are in essence forced to have their kids vaccinated becuase no real option exists for the kids to attend elsewhere and\or comply with the law.